Here is a new Spitfire artwork from Vladimir Urbanek. 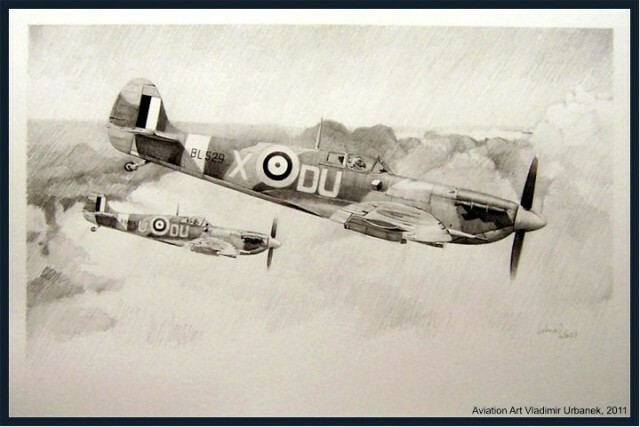 Entitled Pitchy Day, this pencil drawing commemorates a dramatic episode from the history of No.312 (Czechoslovak) Squadron. On 24th January 1942, a pair of unit’s Spitfires on their way home from patrol found a solid cloud cover over Wales. The aircraft were Supermarine Spitfire MK.VB DU-X, serial number BL529 piloted by F/O A.Liska and DU-U, serial R6883, flown by Sqt. M. Liskutin. As it soon turned out, thick cloud stretched all the way down to the ground. Unable to make visual contact with the ground or receive safe bearing to an airfield, the pilots lost orientation. As all prospects of a safe landing proved fruitless, Liskutin bailed out, his aircraft crashing to the ground. F/O Liska opted for a forced landing on the seaside. Luckily, he managed to execute a clear belly landing on the beach and escaped unhurt. However, his Spitfire was also lost to sea tide before it could be salvaged.